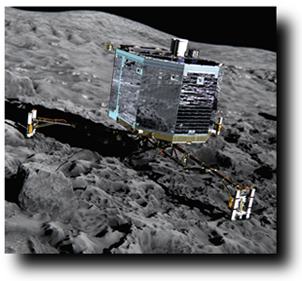 Motion Control – Successful Landing on Comet Chury! Rosetta mission employs Swiss drive technology. For the first time in the history of space exploration, scientists have access to substantial data from a comet’s surface. The European space probe Rosetta successfully guided its lander Philae to touch down on the four-kilometer Comet 67P/Churyumov-Gerasimenko, a.k.a. Chury. 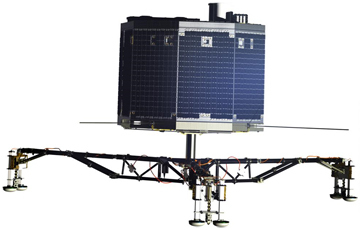 The Philae lander has a mass of 100 kg and features ten instruments. Never before has a DC motor been exposed to vacuum for this long. However, the motors have now passed an initial motion test, which is a promising sign. The individual instruments on the lander will start being automatically activated in sequential order. Within a day or two, the micromotors will lower the APXS from the lander’s belly to the surface of the comet. The Rosetta project is expected to continue until the end of 2015, when Chury returns to the outer reaches of our solar system. Until then, researchers want to collect as much data as possible from the comet’s core and tail – and maybe answer the question of whether comets once brought water or even life to Earth. « Linear Motion – H2W Introduces XZ Brushless Linear Motor Positioning Stage!